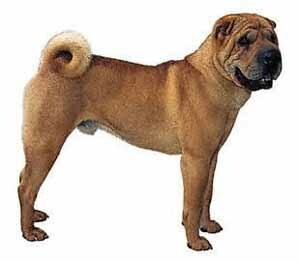 The Chinese Shar-Pei or simply Shar Pei is a breed of strong dog known for its distinct characteristics such as the wrinkles and blue-black tongue. As the dog grows the wrinkles begin to disappear. In 1978 it was named as the world rarest dog breed by the Time magazine and the Guinness Book of World Records, and was not recognized by the American Kennel Club until 1991. It makes a good watchdog because not only is it terrifying to the strangers, but also is devoted and affectionate to his family. This breed survives for nearly 10 years.